If you are a parent, you want to provide for your child and be the best parent you possibly can. At TELL, we want to help you be not only the best, but also exceptional in your parenting. Through our Exceptional Parenting Program (EPP), we offer a range of educational workshops for families, educators and professionals who work with children with learning differences and diverse needs. 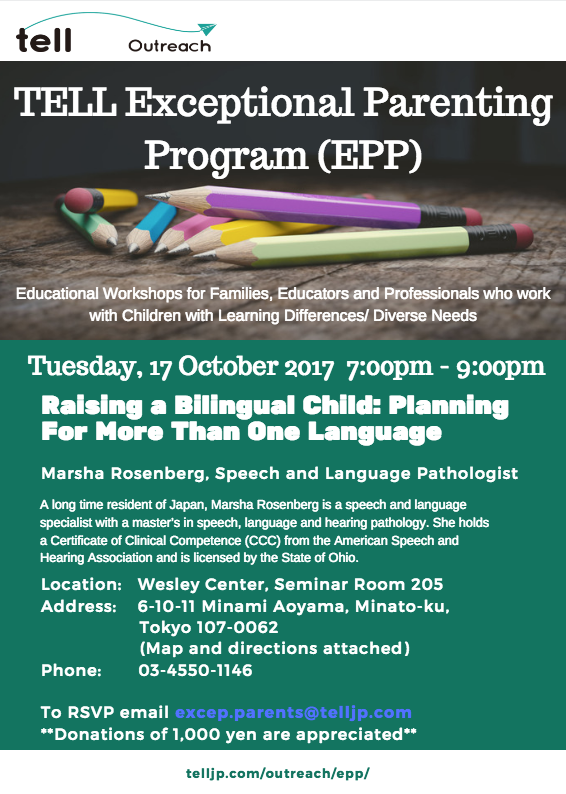 On Tuesday 17 October, speech and language pathologist Marsha Rosenberg will be leading a workshop on raising a bilingual child. The workshop will offer professional advice on how to plan for your child’s development and look at the challenges of raising children in a bilingual environment. If you are raising a bilingual child, or would like to know more about how you can support your child growing up in a multi-lingual environment, come along to learn more. Details: To RSVP email excep.parents@telljp.com. Donations of 1000 yen are appreciated.